The Only True Plug-N-Play Solution for Tracking Your SAP NetWeaver Portal Usage. Now available for SAP Fiori! The smart alternative to the standard SAP Portal Activity Report (PAR) and Activity Data Collector (ADC) for tracking your portal statistics. SAP Certified Solution – The first and only complete usage analytics tool developed solely for the SAP Portal - install with confidence. Click Stream: Finally, the easy win application to quickly access usage statistics within your SAP NetWeaver Portal. How many unique users log into my portal in a specific time frame? Am I reaching my target audience? How often and which users are visiting my SAP Portal? Exactly what areas do my administrators/management/IT need to focus on? And of course for all you managers out there, where am I spending my portal dollars? Uncover the answers to these questions and many more. Numerous reports with rich filtering functionality give you the in-depth information you need to know about your SAP Portal. This extensive data is even provided to you in real time...without ever having to unscramble another flat file! Make decisions faster and easier than ever before. We also included an API feature. Build your own front end using your API with the data Click Stream already provides. Great for partners doing an SAP Portal implementation. And finally, we introduced a convenient HTML based mini dashboard. This handy iView can be for end users, budget decision makers, or both to immediately check their SAP Portal usage from a 10,000 foot view. 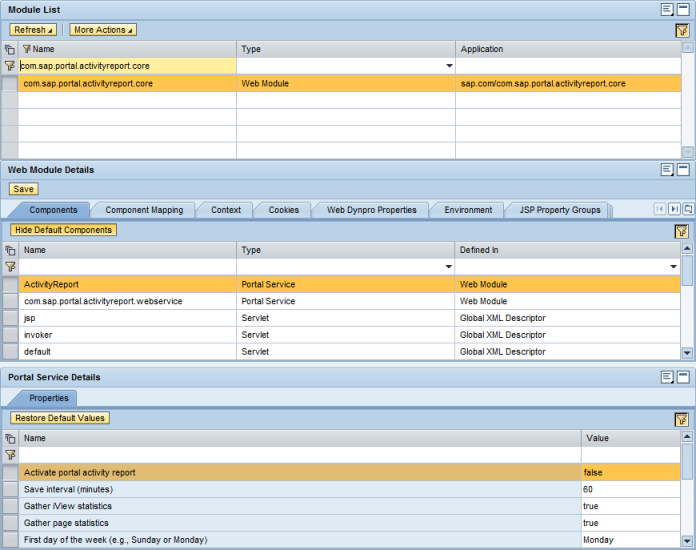 We deliver this tool out-of-the-box in the Click Stream EPA using the existing SAP Portal theme. Personalize it to show or hide numbers such as the current active users, the number of users yesterday and today, the number of page views yesterday and today, and the maximum page views and users per day over time. 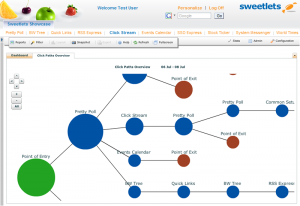 Sweetlets offers a free, fully functional trial version of Click Stream for you to use in your SAP Portal. Download today and start gathering usage stats right away. Simply follow the easy download instructions here. …by longtime SAP Portal experts! Click Stream is the powerful analytical tool designed by SAP Portal experts - specifically for and living exclusively in the SAP NetWeaver Portal.No more fighting to fit analytical tools designed for the World Wide Web in your portal - and never getting them quite right anyway. Cut to the chase! Get a simple plug-in application developed exclusively for your SAP Portal...by SAP Portal experts. Because we live in the portal space, we use the already existing information from your corporate LDAP to filter any report by any user attribute. Click Stream leverages the User Management Engine (UME) API to record all relevant information and the Portal Content Directory (PCD) API to get extensive information about your pages. Dissect problem-solving data collected with greater accuracy and make better, more educated decisions -backed with hard proof. Try finding another global web application or analytical tool which can really get under the hood and inside your IT baby! How do we know the SAP Portal so well? The development team here at Sweetlets was actually part of the very first SAP Enterprise Portal implementation (5.0) back 2002. Our longtime experience in the SAP Portal space gives Sweetlets the inside edge on application development and knowing exactly what is right for your SAP Portal. When you have questions, we have answers. Have the utmost confidence knowing who you are dealing with and what you are getting - the right solution for the right job, right from the start. 100% SAP Certified - this makes 15! Certifying Click Stream with SAP is the 15th 100% SAP approved business package for Sweetlets. We have been committed to the SAP NetWeaver Portal since way back in 2004. Discover hands-on reports you never had easy access to before – plus many others. 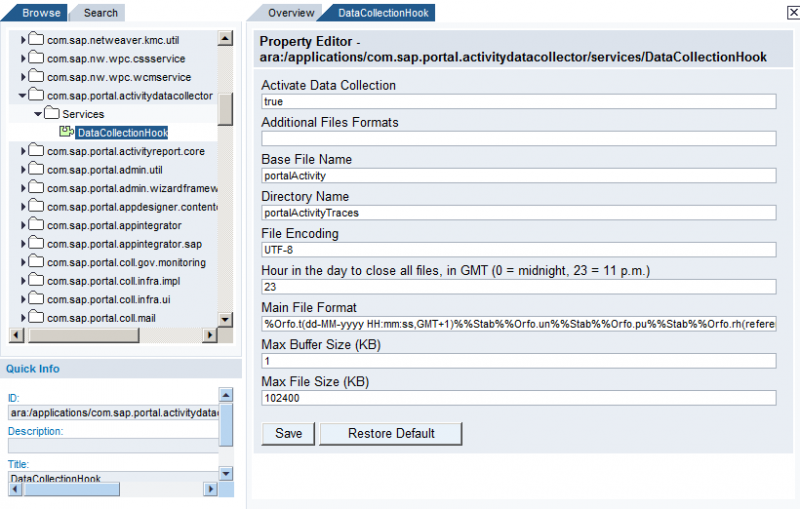 No more fighting with the Portal Activity Report (PAR) or Activity Data Collector (ADC)! All your reports now deliver data to you in real time - no pre-processing of log files needed. And why worry about server nodes or PCD IDs when you don't have to? Sit back and enjoy the user-friendly interface of Click Stream's reporting. Sweetlets utilizes the latest Adobe Flex technology to serve you with beautiful and intuitive graphics, enhanced exporting functionality and extensive filtering capabilities. Say you need a spreadsheet of your results to show your boss - no problem! For added flexibility, just click the Export tab and transfer your new found data to Excel. You even have your choice of a comma, semi-colon, or tabulator table. But perhaps it is an image you desire for your upcoming presentation to support your new found discovery? Try the Snapshot feature in the toolbar. This handy detail will grab a copy of your report in either JPEG or PNG format for easy cut and paste to your PowerPoint. Simple! Now you’ll make a far greater impact on your board members with a dynamic visual representation of your finding! Turn your data into valuable information and that intelligence into educated action. Click Stream is any manager’s control panel to their SAP Portal. But this really is only the beginning. With the extensive filtering available in Click Stream, a wide range of detailed criteria within reports is possible. Extracting these reports to view on a regular basis with the same specific date ranges, groups, roles, pages and any other attribute can be a tedious task. Therefore, we added a nice little feature - the option to save your pre-configured reports for easy recall. Simply put together your predefined settings in a report, save, and then choose it from the drop-down menu whenever you need it. Are you the hunter or the gatherer, the IT or the administrator? Either way, if your portal looks poor, you look bad. And of course, what you can't measure, you can't manage. It is no secret, bad decisions are based mainly on lack of information. That is, not having enough information to make good quality decisions. The Click Stream business package includes many ready to use, clearly understood statistical reports…for you or your administrators. Imagine how much easier it will be for you to support conclusions on your SAP Portal roadmap at the click of a button with nothing but the facts right in front of you. Click Stream lets you combine the filter criteria above or use the wild-card option for filtering on specific content areas in your PCD. For example, how nice would it be to get the traffic (user, logins, page views) for the last month, but only for groups "HR" and "Finance" which had the role "Employee"? Nice...but we didn't stop there! What if the example above was not enough for your boss? He wants to track each employee by country, company and department. Since Click Stream lives solely inside the SAP Portal and leverages the UME - it knows everything there is to know about your user. This is only one huge advantage to having an SAP Portal specific app and not just a broad website or a web analytical tool like Google Analytics. The SAP standard PAR (Portal Activity Report) does not use the UME (User Management Engine) to retrieve country information from LDAP. Instead, the PAR attempts to map countries based on IP addresses. This may work on a website as tracking IP addresses is potentially your best option. But within an intranet environment (such as the SAP Portal) where who knows how many users share the same local and/or internal IP addresses, the accuracy of user information can be highly distorted. Leveraging the UME from within the SAP Portal enables Click Stream absolute accuracy on portal statistics. Simply map desired information from your corporate LDAP to your SAP Portal with Click Stream. Then filter any report by combining information from your users such as company, department, country, etc., together with role or group information on any page. 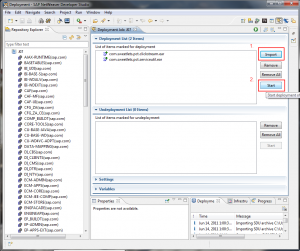 All LDAP attributes can now be used for recording and filtering. Ever wonder how many unique visitors you have in a specific time frame? One-click access to the Traffic report and you are in! Next, filter down your user criteria by group, role, or date range – then just click ok. Presto! Up comes unique visitors within your chosen time frame. Now compare your unique visitors to logins and pageviews. How about a different time frame? The added flexibility of the date slider allows you to really hone in on specific dates or times within your SAP Portal. Really get to the core of your traffic at the click and slide of your mouse. How about your portal traffic on a 24 hour day? When are your peak times? Or do you know how much traffic your portal has on a weekend? Use this information to find best time slots for maintenance windows without disturbing your end-users. And if you like, bring organization to even the largest database by selecting a line or table chart, whichever best displays your report. But don’t forget to make use of the powerful export options like transferring your reports to Excel or even saving the image in JPEG or PNG for presentations. Filter on specific group/role or user attribute in the drop down menu. But I have 100,000 users...and more? 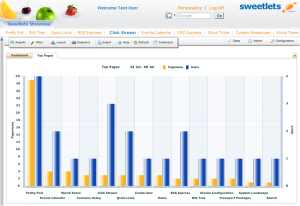 Sweetlets developers have tested Click Stream in SAP Portals at the 100,000 plus user range with great results. We even tested a portal with 160,000 users strong and 4,000 concurrent! (4,000 users hitting the portal at the exact same time) The final outcome... minimal footprint and most importantly, no impact on end user experience. Expand the "160,000 user experience" box to the right to get more details. Curious to try or have questions? Are you curious about how Click Stream will perform in your SAP Portal? Want to know more details on user experience, have questions, or just want to try for yourself? Simply contact one of our technical team members at support@sweetlets.com and we will be more than happy to help you. 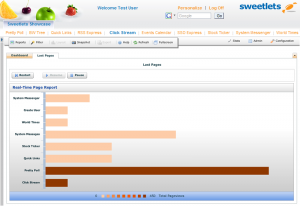 We designed Click Stream to run in SAP Portals with a very high number of users. Our recording has also been designed to deal with many users logging into the portal at the same time by queuing information to store. In the 160,000 user portal, load tests with up to 4,000 concurrent users and more than 20 server nodes proved successful! The impact on their portal server CPU with our Click Stream recorder iView resulted in only about a 2%-3% increase. Better yet, the end-users don't recognize any difference! In production, everything runs smooth and we have a happy client! Many of our clients are using a database server for Click Stream without fail-over since it is not mission critical and cost saving. What if your database for Click Stream is not available? 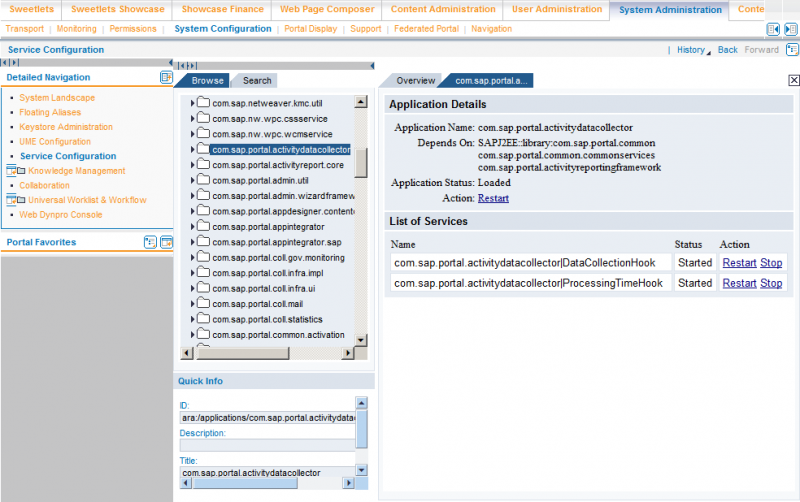 What happens with your SAP Portal? Our recorder is intelligent enough to recognize this and handle the scenario so your portal will not be harmed. In the end, you won't notice any negative impact on your portal server and your end-users won't recognize any change. This has been intensively tested together with clients in real-life scenarios. Store you company’s valuable information on your own server, not the World Wide Web. Who is in control of your company data? When it comes to securing your important company data, isn’t it best to keep it in-house and on your own server? Does it make sense to store such sensitive employee data out there on the WWW? Unlike others, Click Stream gives you complete access to your own database. There is no need to rely on "their" servers sitting in another part of the world to get the reports you need. Do yourself a favor, take a look at the software agreement of those other analytics solutions – they can shut you down whenever they want or restructure on their own terms. This could leave your company high and dry. Don’t be left wondering who is looking at your company data. Take control! At a quick glance, discover how many unique users have logged into your SAP Portal in the last three months, along with a projected trend. How many users log in per month? What your forecast is for the current month? Is this user trend going up or down? How many pageviews do you have per month? What is your forecast and where is the trend going? How many PCD pages you have in total? Total PCD pages vs pages that are actually being used? If you are constantly adding pages to your portal but have no idea how many of these are actually getting used, the Active vs Total PCD pages graph is essential. The highest we have actually seen the number of pages being used vs the total number of pages in the portal was 25%. Typically this number is in the 5%-15% range! How would that affect your portal performance? 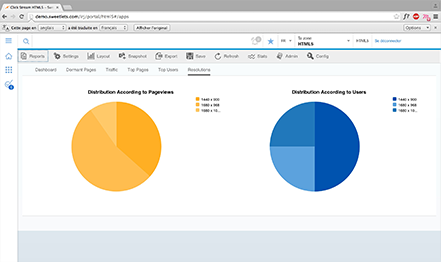 Why not identify all the important pages, the ones actually being used - and maximize efficiency in your SAP Portal by focusing on content that really matters? 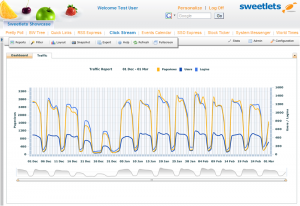 The Traffic Report illustrates pageviews in relation to the number of users and logins for a specific time frame. The broad filtering capabilities help you to identify the actual behavior of your audience. Take a detailed view of your portal traffic - hourly, daily, weekly, weekdays or in the last 24 hours. Then use the filter feature to see this traffic on specific groups, roles or pages. What is your portal traffic based on a 24 hours view? Use this feature to gain helpful insight into scheduling maintenance windows during off-peak hours. Also, combine this information with traffic per weekday to figure out how many users logged in last weekend? Learn if a newly implemented "Area" has a significant impact on your overall user visitation. Apply the filter feature to illustrate traffic on a page or multiple pages. Does your load balancing work properly? 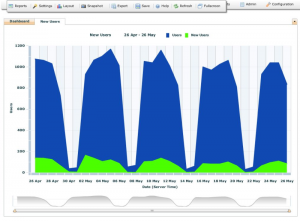 Watch the capacity per server node based on users, logins and pageviews over a given time frame. Need help to determine the sizing of your SAP Portal? The Peak Loads report helps your IT identify at a quick glance, the maximum number of concurrent users, logins, or page views per hour, minute, or even seconds. It simply just takes the Traffic report to the next level in granularity. And once your IT can establish the maximum user load, sizing your portal accordingly becomes a breeze. 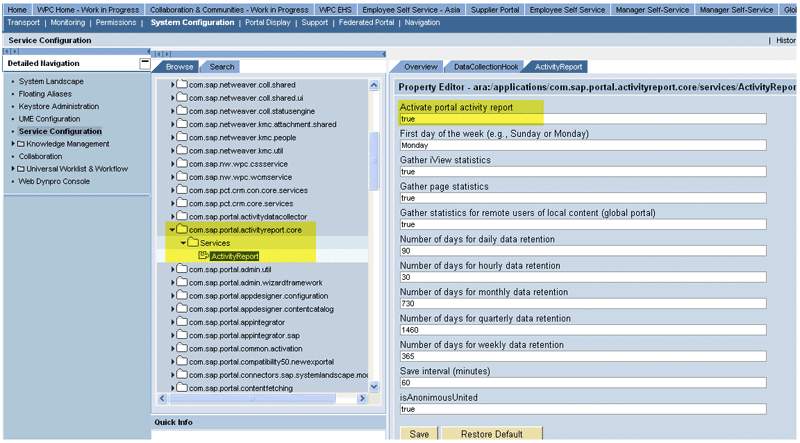 Everything you wanted to know about your SAP Portal pages – best performing, least visited, and even unproductive pages. Choose between bar, pie or table chart to find out your "hot and not so hot" content. Get specific information about your departments. 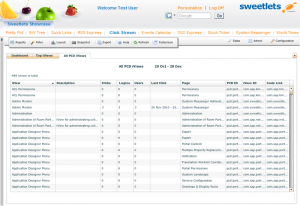 Filter your top pages based on 1st and 2nd level navigation by using part of the PCD ID - or just filter by group or role. Any specific details related to this page such as top users, resolutions, browsers, etc. If you are curious about what questions the Page Report can help you answer, open the box to the right. Get detailed information on your most important portal pages, those with the least pageviews, unused pages - and even external content. The Page Report is extremely useful and gives you access to some of the most important pieces of information you need for a successful SAP Portal. What content should I be focusing or not focusing on for the absolute best use of my man hours? Are my users coming back to specific pages for a second or third time? Which pages are being clicked on at all and how much? Which pages are being viewed and by which department, group, role, etc. And armed with these questions above, you can then go back to your users and ask them why certain pages are hot or not. Then rinse and repeat. (The best way to get an opinion from your users is to try our Pretty Poll application. It is a simple business package iView which accepts votes on questions you submit. Essential for user feedback. See our Pretty Poll page. Track exactly which path your users follow in the portal and how they access content. Discover specifically where your users are coming from - and more importantly, where they were going. Does a specific page in your portal interest you? How many users choose this page as their landing page? Or where did they enter the portal before they came to this page? And when they left the above page, where did they go? Did they go to another page in the portal or log out? The Click Paths report shows the complete journey! Learn more about your community – Click Stream leverages the SAP Portal UME (User Management Engine) to gather information about users and their groups, roles, companies, countries, etc. The SAP standard PAR (Portal Activity Report) does not use the UME to retrieve country information from LDAP. Instead, the PAR attempts to map countries based on IP addresses. This may work on a website as tracking IP addresses is potentially your best option. But within an intranet environment (such as the SAP Portal) where who knows how many users share the same local and/or internal IP addresses, the accuracy of user information can be highly distorted. 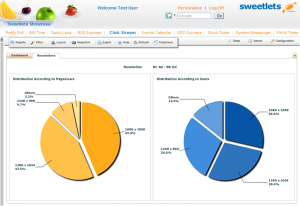 Leveraging the UME from within the SAP Portal enables Click Stream reports with absolute accuracy of portal statistics. Who are your top users? What are their favorite pages? Which country is the most active in your portal? How about a combination of all the above? Use the filter feature in any report to combine groups, roles and pages to really narrow down your search! For European work council, keep in mind Click Stream has the option to anonymize user data. A simple check in a box records users nameless with no way to track back. And don't forget, Click Stream also stores your valuable company data in your own secure database, not the world wide web! If provided via your corporate LDAP, you can track a lot more information about your users. E.g. The US state, cities, department codes, etc. they come from. Want to find out which screen resolution your portal users really have? The various information provided in the Technology Reports is another one of those "must have" resources for your IT development group. Get them focused on building content that really matters - right from the start. Peek inside to discover a complete breakdown of all the essential reports they need. 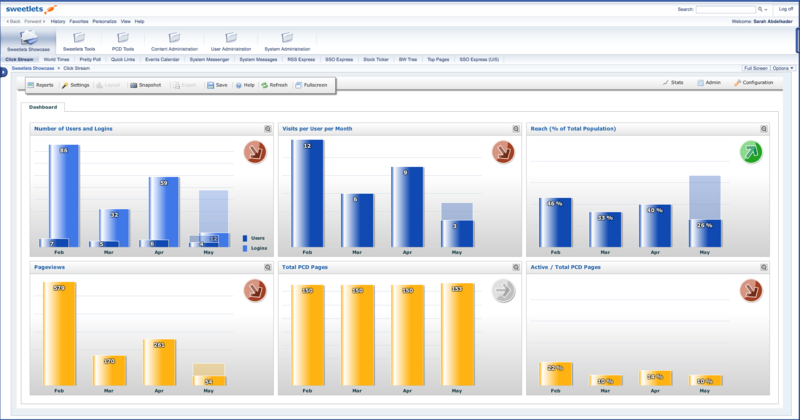 How much effort did you put into designing your SAP Portal? Do you know the average screen size of your users or the minimum screen size you need to support for 90% of your users? The Screen Resolution report will help you with this. How about power users who deform the picture? 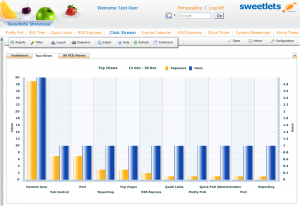 Just take a look at the users and compare them with the number of page views. And discover if all your users really have IE 6 like your IT team thought when you open up the Browser report. Make sure you are connecting or reaching the people you want to reach and connect with. All Click Stream reports deliver data in real time. We developed the Real Time Report so watch your SAP Portal traffic – as its happening! Watch your SAP Portal traffic - right now! Just watch our real time reports and see where your users are clicking at this very moment! Also included is a pause, resume and start option. If you are like many of our clients, introducing new pages into the SAP Portal is a regular occurrence. But aren't you curious about your initial user experience after introducing one of these new pages? Upon implementing a new page over the weekend, one client, in particular, would watch their users reaction to the new page first thing Monday morning when employees logged in. They were able to observe - in real time, users response to the latest changes. IT could not only physically watch what people were clicking on when they got in – but how they were clicking around within the newly implemented page. The Real Time Report gave the IT department considerable insight into their usage patterns and immediate feedback on content development projects. Afterwords, IT would then follow up with the Traffic Reports, Page Reports and Click Path Reports to get the big picture. Watch user traffic in real time. See what is really happening in your portal... right now! Have you ever needed more granular information on your pages rather than just page views? Did you ever wonder which iViews your users are actively using? This desire to have a more in-depth analysis of exactly what is happening on every page within the SAP Portal is why Click Stream now monitors each users iView clicks – delivered on an easy-to-read report. The first click in an iView is recorded per page view. All subsequent clicks will be ignored until the next visit to this page. This smart report also supports Flash objects in recording. The "Top iViews" report is a summary of the iViews which were clicked most often. The “All PCD iViews” report is a summary of all iViews from pages which are listed in your “All PCD Pages” report. Read our complete documentation about Click Stream for more in-depth information. Start recording the clicks in your iViews. ... and has different needs. Sweetlets understands this. Through listening to you, the customer, many of our feature enhancements have come as a result of client special requests. We love feedback, so keep it coming. If you need a report or feature not yet available in Click Stream, just ask. Contact our support team at support@sweetlets.com with your special request for more insight how we can work side by side to get the results you are looking for. Why is the “Reach” diagram in the upper right corner of the dashboard empty? Whenever the target population changes, just enter the new numbers. Otherwise the last value will automatically be used for the subsequent months. Please contact support@sweetlets.com for any additional help. What database does Click Stream support? Click Stream supports MS SQL, Oracle, IBM DB2, and now SAP’s MaxDB. Please contact support@sweetlets.com for any additional help. How do I use the parameters category and parameter of the External Content API? The parameters category and parameter do not have a dedicated meaning. It’s up to you to decide, which additional details you want to store in these columns. Please note, that the value of the category can be used for filtering, but not the value of the parameter. Standard user attributes can be used for filtering per default. These filter criteria include groups, roles, company, department and country. To get a list of all available filter criteria, open the External Content report, click the Select button and open the Select… drop-down. See the FAQ about the External Content API Please contact support@sweetlets.com for any additional help. Does turning off the PAR or ADC have any impact on Click Stream’s recording? Q. Now that we are using Click Stream for our portal activity reporting, we would like to turn off the SAP standard portal activity reports for performance reasons. If I deactivate the following configuration, will this have any impact on the Click Stream data collection or reporting? A. No, the standard portal monitoring is not required for Click Stream. 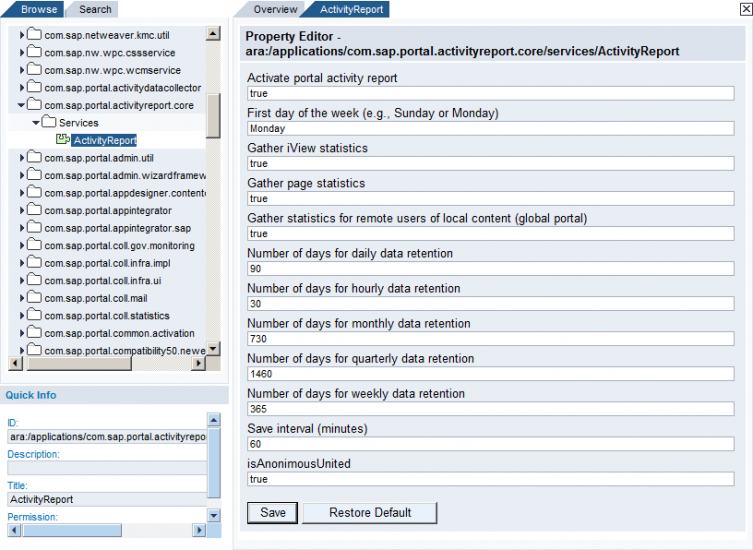 You may turn off the Portal Activity Report monitoring as well as the Portal Activity Data Collector. Also see: How to Stop SAP Portal Activity Report Also see: How to Stop SAP Activity Data Collector Please contact support@sweetlets.com for any additional help. How can I exclude anonymous users from a report? (By isolating this or any other group in the Filter settings, Click Stream will process reports only within your indicated/selected category.) Please contact support@sweetlets.com for any additional help. Click Stream does not provide user names, nor user ID’s in my reports. Please make sure the “Anonymize Data” box is un-checked. It is located in the Configuration under the Settings tab. Click Stream comes shipped out of the box with it checked so that it does not display the real names of the users (in compliance with the European Work Counsel law) Keep in mind, any of your old ID’s will still remain anonymous with a scrambled ID. These scrambled user entries cannot be unscrambled for legal reasons. And anything since changing this setting going forward will be recorded using proper names and IDs. Only new users will be recorded with their correct usernames and IDs as plain text. This is explained in further details inside the chapter, “Anonymization” of the Click Stream Installation Guide 2.3 on pages 33 and 34. See, “I only get ‘user1″ in my Top User report‘ for a related FAQ Please contact support@sweetlets.com for any additional help. The Portal Activity Report is enabled by default in NW 7.0 as well as in NW04. Only starting from NW 7.3 it is disabled by default. If you do not use this feature, you should disable it, in order to improve the portal performance, as this feature gathers statistics for every iView and page that are being rendered in the portal. The portal activity statistics are collected, and then being processed on the database, consuming database as well as server resources. Please contact support@sweetlets.com for any additional help. 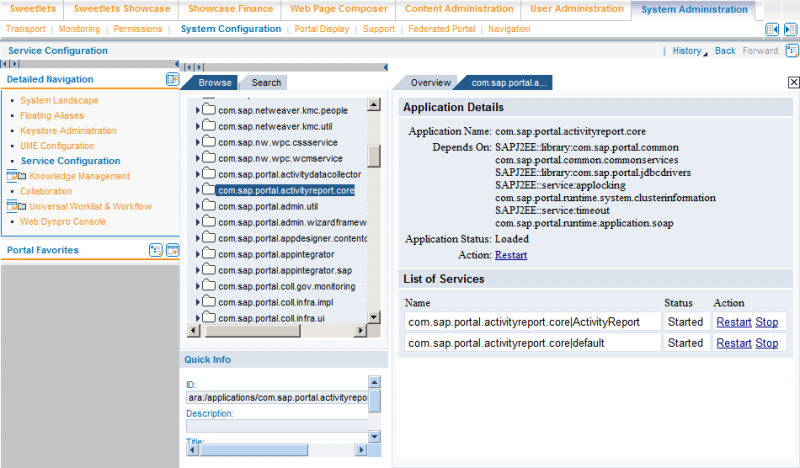 This page from SAP Community Network answers most of the functionality related questions on using the Portal Activity Report. http://wiki.sdn.sap.com/wiki/pages/viewpage.action?pageId=219022360 Please contact support@sweetlets.com for any additional help. How do I use the Click Stream recorder within the Ajax framework page? It does not really matter where you place the recorder iView within the Ajax framework page. We developed the recorder so there is not much to consider on your end. But as an example, just use the Page Tool Bar container. Please contact support@sweetlets.com for any additional help. How can I edit/delete a saved report in Click Stream? How does Click Stream take the PCD data to record the hit count of a portal page or iView? 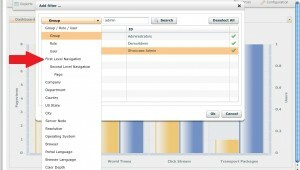 Click Stream is using its own recorder iView to store information about page hits and clicks in iViews. The recorder iView itself is using all available APIs provided from the SAP Portal such as PCD API, UME API and navigation API etc. Please contact support@sweetlets.com for any additional help. The default framework page on 7.3 is the AJAX Framework Page which comes without a desktop inner page. Therefore, the recorder needs to be placed in the Technical Hidden iViews Container instead. 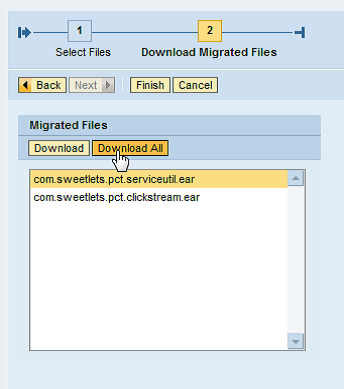 (Find more information on how to upload EAR files at “How to migrate and upload portal application files to NetWeaver 7.3.”) Please contact support@sweetlets.com for any additional help. Execute the deploy command with the path to the EAR location as an argument, along with version_rule=all as a parameter. Now you have the choice to use NWDS for deployment of the EAR files or if you choose to use the AS Java Telnet command line tool from SAP or JSPM running on the server. Please follow the description above. For additional information, the SAP Community Network also provides some great insight into this procedure: How To Migrate Custom Portal Applications to SAP NetWeaver 7.3 Please contact support@sweetlets.com for any additional help. How does Click Stream determine the number of users in an SAP Portal for licensing? Click Stream determines the number of unique users based on login ID within the last 90 days. Please contact support@sweetlets.com for any additional help. You must restart the service com.sap.portal.activityreport.core for the changes to take effect in NetWeaver Administrator: From the Module List, choose More Actions and then choose View corresponding to application. 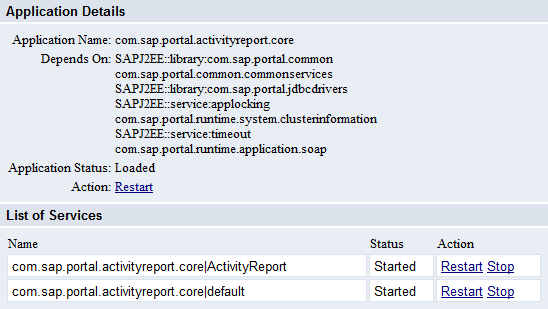 In the displayed application list, verify that com.sap.portal.activityreport.core is selected and choose Restart. Source: http://help.sap.com/saphelp_nw73/helpdata/en/47/87329cc84a199ce10000000a42189d/content.htm Please contact support@sweetlets.com for any additional help. Source: http://help.sap.com/saphelp_nw73/helpdata/en/47/8ac2e51b141e1ee10000000a42189d/content.htm Please contact support@sweetlets.com for any additional help. How will Click Stream impact the existing load and performance within my SAP Portal? We are proud to say the additional load on the Portal side is very low. As for performance and load, our largest installation (160,000 users) is at a company in the US with great results. They are running a separate database instance for Click Stream since they have more than 120,000 different users visiting their portal each week. After 6 months, approximately 25 GB of data was collected. The performance load tests with more than 4,000 concurrent users had a minimal impact on the Portal CPU of about 2-3% and almost nothing to the response time. This has also been tested intensively with other clients. The impact on existing loads and performance can be somewhat of a tough question as every client differs. Too many things play into the quotation… number of users, network traffic, latency, etc. etc. Most of our clients have a regression system to test drive with load tests. They compare without Click Stream (for example, turn off recording) and with Click Stream. Some of our smaller clients have added the Click Stream database to their SAP Portal database as a separate instance because there was enough power left. For some, this wasn’t an option and they are using a separate database server. This depends on your existing landscape. We only suggest to separate the database content from the SAP Portal for easier troubleshooting after Enhancement Package XYZ. With MS SQL just use a separate database and with Oracle just use a separate user/schema. Any other information which may be of help to us. Why is Click Stream not recording? This should not be a big deal. It is probably either one of two items: Wrong framework page – Are you sure you have added the recorder iView to the correct framework page? You can confirm this by verifying the HTML source code of a page or use HttpWatch to see if the recorder is there. Please also refer to our Click Stream Installation Guide located in our Downloads on where to put the recorder iView. Permissions – Please make sure that the recorder iView can be accessed by “Everyone”. (As above, refer to our Click Stream Installation Guide in our Download area on how to set the permissions. (page #8) **Please note: You must be a registered user to access Click Stream documentation. To register, click here. Please contact support@sweetlets.com for any additional help. I only get “user1” in my Top User report. For legal reasons within the European Union, a user’s name must remain anonymous. However, some of our international clients prefer to get actual usernames in their reports. We have enhanced Click Stream to give your company the option to monitor their users or keep them anonymous. This is an easy change in our configuration wizard. Simply go to: Configuration > Settings > General Settings > User Information Check mark “User Information” box to anonymize data: Click Stream will not track your users. (This is the default setting upon installation.) Un-check (empty) “User Information” box: Click Stream will track your users. Note: Please make sure your company allows your users to be monitored before un-checking (leave empty) the “User Information” box. See, ‘Click Stream does not provide user names, nor user ID’s in my reports‘ for additional insight. Please contact support@sweetlets.com for any additional help. How can we set-up recording on user attributes such as department, country etc.? Let’s take an example and let’s configure the SAP Portal to get to know your user’s countries from your MS ADS: Country is an existing logical attribute and not a custom one. Please add this attribute named country to your list of user attributes in your XML for nameSpace “com.sap.security.core.usermanagement” (for more information see UME LDAP Configuration Tool). However, the latest version of Click Stream, Click Stream 2.0, is also able to record and report on any user attribute you like including custom attributes you have defined in your UME configuration. Please just use our configuration wizard to add such attributes for recording and rename reports to your own preference. If you also want to monitor your users' state information, please add this attribute named state to your list of user attributes in your XML for nameSpace “com.sap.security.core.usermanagement”. We have added a US Map where you can see your user distribution across the US states. Please also add the attributeMapping to your LDAP as below. The default name for the state information is st.
You want to track special links, hot buttons, external content? Does it work with Ajax framework page? 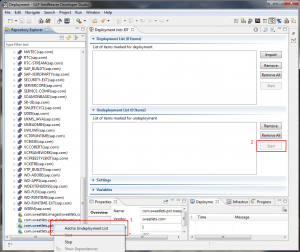 Do you use an Ajax framework page in your SAP Portal? Or do you plan to use one in the near future? Click Stream also supports to run in an Ajax framework page. Please contact support@sweetlets.com for any additional help. Do you have a Federated Portal Network (FPN)? Does Click Stream work with Federated Portal Network (FPN)? Yes, Click Stream works with FPN. If Click Stream is installed on the consumer portal, any page view on remote content can be monitored. There is just a small limitation: Page details from the Portal Content Director (PCD) like creator, changed by from remote pages cannot be viewed in reports as this data lies in the remote PCD. However, all important reports have the most relevant data to analyze. Please contact support@sweetlets.com for any additional help. Do you see an empty Flash? A right-click allows you to select Play from the context menu? Please ask your administrator to verify two settings for the portal server. Please open: Visual Admin – Cluster – Server – Services – HTTP Provider – Properties. Our support team is more than happy to help in your situation and will respond within 24-48 hours. Please contact support@sweetlets.com for any additional help. However, we do encourage installing our applications in your demo Portal to test drive. Get a more concrete feel of the power behind this business packages and the impact it can have in your SAP Portal. Try Click Stream today! Simply go to our Downloads page and follow the instructions. Please contact support@sweetlets.com for any additional help. How do I try/download Click Stream? Once registered or already registered? Your Sweetlets username or provided email address. The company for which Click Stream is for. Number of named users within your SAP Portal. Click on the file name you wish to download. For the Click Stream EPA file: Accept license agreement, click “EPA” file name, and then proceed with download. How do I purchase Click Stream? To purchase Click Stream, please contact us at sales@sweetlets.com or call us at +49 89 59 08 37-0 for any and all pricing and purchasing inquiries. We will be more than happy to help you. If you would just like to get a quote, see our Request a Quote page. Please contact support@sweetlets.com for any additional help. How do I download Click Stream? Use Click Stream analytics in your SAP Portal today! 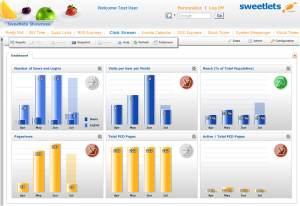 Sweetlets offers a fully functional, free trial download of our Click Stream analytics app. Why free? Because we’re so confident that once you try it, you’re going to love the insight into your SAP Portal Click Stream provides. You will soon discover what you have been missing all along and realize that you simply can't do without this powerful tool in your SAP Portal. Not yet registered or new to Sweetlets? In addition to the Save Reports feature we implemented in Click Stream 2.2 (see news item here), the next logical step with this time-saving feature is enabling our clients to set up scheduling and/or alerts. Soon you will be able to notify yourself or selected recipients to receive selected reports on a scheduled basis? While the current data Click Stream gives you today beyond anything else on the market, we still want to take it to the next level. Close up on our list of cool gadgets include a data comparison feature. Compare last week, month, or year's numbers against another time frame. Determine quickly and easily whether you have a downward or upward trend in statistical data such as portal usage or a specific page. We firmly believe in having the ability to understand and compare the development of your portal usage to be mandatory. This quick observation of vital information for you and your management will soon be available. Besides all other future enhancements, we are constantly working on additional reports - Stay tuned! If you have questions, please contact our team at support@sweetlets.com or call us at +49 89 21 54 77 50 – 0. Latest release: 2.5.13 on April 1, 2015 Note: If you upgrade from a lower version than 2.4.16 to 2.4.17 or higher, please deploy the update during off hours of the portal or during a maintenance window! If you want to use Top Pages iView this data will be pre calculated and cached on a daily basis. See configuration wizard to change parameters. Active users report – see the currently active users who have clicked a page in the last five minutes. **Please note that iView recording will be an additional feature which needs to be purchased as an add-on. Please contact sales@sweetlets.com. Please note: new license keys for version 2.x are required. 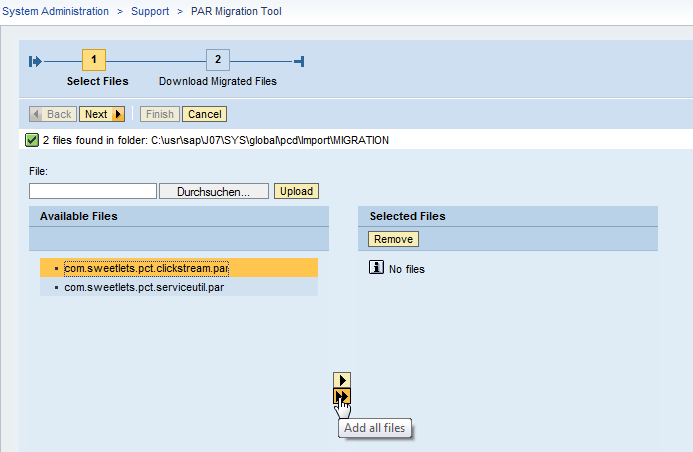 Latest release: 1.3.26 on March 3, 2010 Migration: In case you are using Click Stream 1.0.x, 1.1.x or 1.2.x and want to keep your existing data, please contact us for a migration path which we have prepared for you! Pricing for the Click Stream SAP Portal analyzing solution is simply based on the total number of named users within your SAP Portal. Or in other words, the total number of users Click Stream will be monitoring. Purchase consists of a one-time license fee along with a support fee paid annually.